It's January 15th! Do you know what that means? It means that Valentine's Day is officially less than one month away! I LOVE celebrating Valentine's Day at school. Ever since my first year of teaching maternelle, I have always found Valentine's Day to be a super special day in the classroom. There is something about every student giving cards to every other students that just warms my heart. I love that moment at the end of the day when everyone is passing out cards, reading their friends' names, sliding them into their mailboxes, and then excitedly opening every single one. 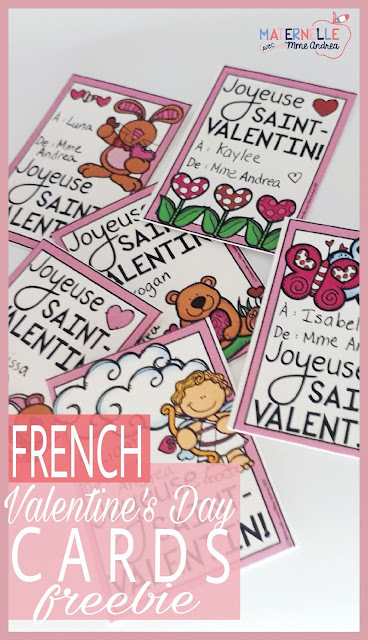 To help you celebrate this special day with your kinders this year, here is a quick list of my favourite French Valentine's Day resources - the ones that I use in my classroom year after year! As with my Favourite French Winter Resources, most of these are freebies. But, I have tossed in a couple of paid resources at the end, as well. As always, just click on any of the images or on the name of any resources to be taken to them on TPT! And, as always, all of the freebies created by me are also available in my FREE French Resource Library, if you're a member. If you aren't a member yet, but you want to be, just enter your name & email below, click the pink button, and I will send you the password and access instructions right away! Here are a few of my favourite FREE French Valentine's Day Resources! My students love these colour by sight word activities, so I have them for most holidays/seasons. Valentine's Day is no exception! 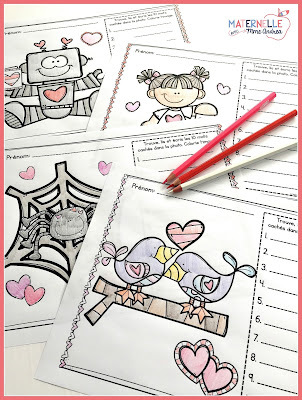 Your students will be working on differentiating between similar-looking sight words as they colour in the Valentine's Day pictures according to the legend. You may have already seen these in my Free French Valentine's Day Cards post, but just in case you missed them, these Valentine's Day cards are a freebie in my store. They are perfect for printing out on card stock and handing out to your students during your class party! These free vocabulary cards are also from my store. They are perfect for adding to your word wall, or to use as flash cards, mini books, and more. I like to laminate them and put them on a binder ring, and then add them to our writing centre. If your students enjoyed the colour by sight words sheets above, they will probably love this cute colour by number activity, too! We are working hard on our number sense to 10. My favourite thing about 10 frames is that you can find tons of adorable ones from English TPT sellers and/or bloggers, and use them in French! These are a perfect example. While I probably won't be giving my students candy hearts to represent the correct numbers (because they will definitely eat them, no matter how dirty...), we will use other, non-edible thematic manipulates to practice counting to 10. This matching activity is a super engaging way to encourage students to look for letter and sound clues to help them match vocabulary words to the correct images. By this point in the school year, most of my students usually know enough sounds to make this activity a success. These are so fun! They would be perfect for your class party. Headbands are always a hit in Kindergarten! This free mini book is PERFECT for maternelle. It has a very simple structure and practices the high frequency word "j'aime" on each page. I usually read it a few times as a class, have my students colour their own copies, and then send them home in their reading bags to practice with Mom or Dad. And here are some of my favourite paid French Valentine's Day resources, that I will be using in my classroom this year! These I Spy sheets are always popular during centres, or as a whole-class activity. Since I am just returning to work from my mat leave, I will probably do this as a whole class activity first (as long as I still have enough magnifying glasses! ), so that my class can learn my magnifying glass expectations ;) Then I will add the other sheets to our centre rotation, as an option in the writing centre or fine motor bins. Students need to use their detective skills to find all 10 of the hidden sight words on each page. It's always a hit! 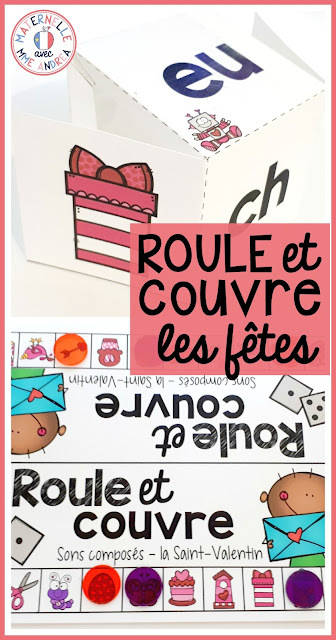 If you have used my Roule et couvre games before, I have recently added a new holiday set to my TPT store. We will be using the Valentine's Day Beginning Sound board starting next week. Roule et couvre is a fun and simple game where students roll a die and cover a corresponding image on their game board. It's great for conscience phonologique, because each holiday includes a game board for practicing beginning sounds, syllables, and les sons composés. These Valentine's Day puzzles are also new in my store. They make a great centre! I put the letter matching set in one Ziploc bag and the beginning sounds puzzles in another, and it is an easy way to differentiate, depending on my groups. Well, there you have it! 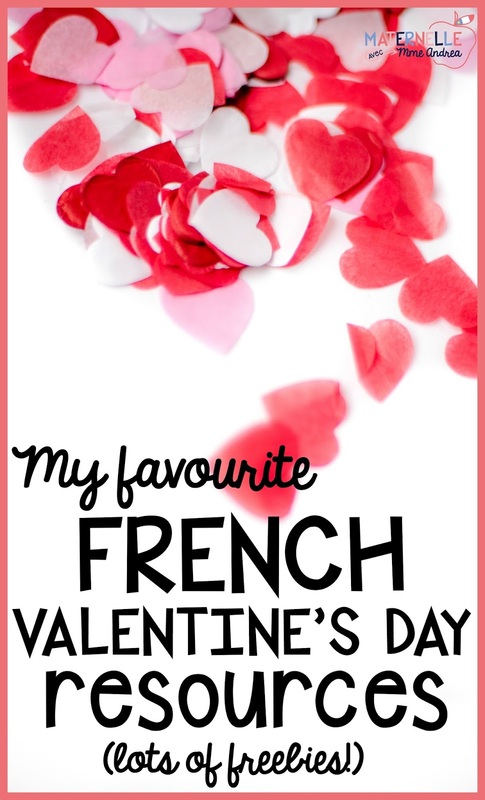 A few of my favourite French Valentine's Day resources. Are we not the luckiest to be able to go all out and incorporate and celebrate all of the holidays at our jobs? FREE French Valentine's Day Cards for Everyone!